Dr. Ganoune Diop, a veteran administrator and respected academic who has lived and worked on three continents, has been elected to serve the Seventh-day Adventist world church as director of Public Affairs and Religious Liberty (PARL). He takes up this position following the retirement of Dr. John Graz, who has led the department for the past 20 years. Dr. Diop was elected to office by delegates of the 60th General Conference Session of the Adventist Church, meeting last week in San Antonio, Texas. For the past four years, Dr. Diop has served as an associate director of the PARL department, representing the world church at the United Nations in Geneva and New York. The new PARL director brings a unique combination of skills, experience, and qualifications to the role. Diop, originally from the West African nation of Senegal, is conversant in 7 languages, and has an in-depth knowledge of three ancient languages, which he taught at three universities. He has previously served as a church pastor, a conference Sabbath School director, a professor of Biblical Languages, Exegesis, and Theology at Saleve Adventist University in France, and later at Southern Adventist University and Oakwood University in the United States. 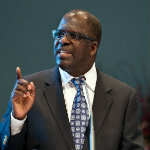 Diop began his service at the General Conference as director of the five Global Mission Study Centers of the Office of Adventist Mission. He holds a master's degree in philology, a doctorate in Old Testament studies, and most recently he was honored with a Doctorate Honoris Causa, granted for his contributions to developing a global culture of human rights and respect for human dignity. Over the past four years, Diop has focused on building strong relationships within the international community with civic, political, religious, and academic leaders. In past interviews, he has said his goal has been to make the case that “Adventists are a blessing”—in both a spiritual and practical sense—to the communities in which they live and worship.